The Joy Luck Club is a modern classic and is one of my favorite books. It is a story of the sacrifices that people make for their families--especially mothers for their children. It shifts back and forth between the past and present. The majority of the flashbacks in the book occur in China during World War II and the atrocities that the Chinese suffered at the hands of the Japanese. After her mother's death, Jing-Mei is asked to take her place at the weekly Mah Jong game that her mother had with her friends. It is during these games that much of the truth about her mother's true character is revealed to her and she discovers just how much her mother sacrificed to come to the United States. Her mother left twin daughters behind in China and it is now up to Jing-Mei to go to China, find them, and tell her mother's story. This is a great book and a must read for lovers of historical fiction. Here is a book trailer to view but I must say it is a little intense. 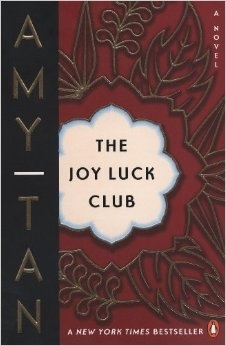 Find out what other KHS students are saying about The Joy Luck Club on our student book review page. This book was also made into a movie in the early 90s. I hope you enjoy reading it and I would love to hear your thoughts after you read it.